Lets Talk Diesel Fuel and Additives? Yes? No? Maybe? Okay, so I know BMW's line on additives is no.. I can't seem to find a minimum recommended Cetane rating in my owner's manual or online, though it seems VW recommends around 50 Cetane as a minimum, and that most European Diesel starts around 52 and goes up to mid 60's for 'premium Diesel' offerings.. I also am finding as I do more and more research that Diesel fuel in general is of wildly varying quality in the good ole USA..
Appears the Federal Government mandates Sulfur content and a minimum of 40 Cetane rating, and not much else, and suppliers seem to have found no market for 'premium' fuels, and they are therefore almost non existent.. It also seems some states have higher mandates for minimum Cetane ratings (Texas and California, for example seem to have a minimum of 50 if I understand correctly).. I've heard claims that higher Cetane ratings can help reduce that just off idle, less than pleasant Chatter/Rattle (I'm completely fine with the Diesel idle noise, and underway/load noises BTW, but this one grates on me, as it just doesn't feel right, almost like knock in a gas engine to me), but my main concern is getting the best performance/mileage and longevity out of our new (to us) X5 35d.. So if what I am reading is right, and most Diesel fuels available in my area barely meet a minimum Cetane rating of 40, maybe there is something to additives for Diesel Fuels (would still love to know what BMW's recommendation is for Cetane rating, and I've seen writings about the big three domestic Diesel truck makers testing engines on, and factory filling with minimum 50 Cetane Diesel). I've also read peoples recommendations to buy from a high volume fueling station, but I don't really live near a highway station that I can be sure of good Diesel turn over. Finding out the amount of Diesel fuel a station moves also seems problematic, as no one at the station has a clue, or information on anyone I can talk to that might. I even went as far as 'talking to' one of the truck drivers resupplying a station, without much clarity.. It also seems nearly impossible to ascertain the actual Cetane rating of fuels at the pump, with most being unmarked, or showing the minimum requirement. And it also seems like important factors like lubricity, detergents, anti-gel, and such are a shot in the dark as well, with little to no regulation..
Southern States seems to be about the only fuel supplier I can find locally with a premium product (Brochure), but the closest station is a half hour plus drive away, and not near any place I travel to regularly. So I started trying to research additives.. There seems to be a lot of good said about a couple of them..
And was wondering if there was any first hand experience here with usage? Maybe even from the crowd running tunes? They seem to tout more power, smoother running and better fuel economy..
Snake Oil, or the real deal? I've heard some claim that these treatments can help reduce the use of DEF as well, by lowering the need for Regen cycles. I didn't realize what a headache fueling a Diesel was going to be. Wish I could be like most and not think about this stuff, but that's just not me.. There are diesel cars and trucks in your area. Log your tanks, and buy full tanks. Use a credit card for easy proof of purchase. If not posted, verify that the fuel is B5 dieesel, not B20 or any other mixture. I fill almost exlusively at Unilcol 76 and Chevron, and really only about 4 or 5 stations depending where in the area I am. I like hotshots products. The edt comes in a nice bottle that you can squeeze up one ounce for each fill-up. I think it makes the truck run smoother - maybe it does or maybe it's in my head but either way it is pretty inexpensive for the satisfaction. Just make sure you are using autodiesel and don't let the forums scare you. Change your fuel filter at proper intervals and everything will be fine. Fuel quality is not just a concern with diesels anyway, I was having trouble with my e90 330xi - turns out that the Rutter's gas station by my home was using 15 percent ethanol on a 10 percent standard. Having said that, the Bosch pump really needs fuel with a higher lubricity (SCAR) rating. This has been talked about ad-nausem in the diesel truck world, and it will apply to the X5 as I believe it uses the Bosch CP4 fuel pump. I highly advise using Opti-Lube XPD. It is one of the best lubricity additives available, and also is a CETANE booster and contains anti-gel for the winter. You can search online for more information on it. 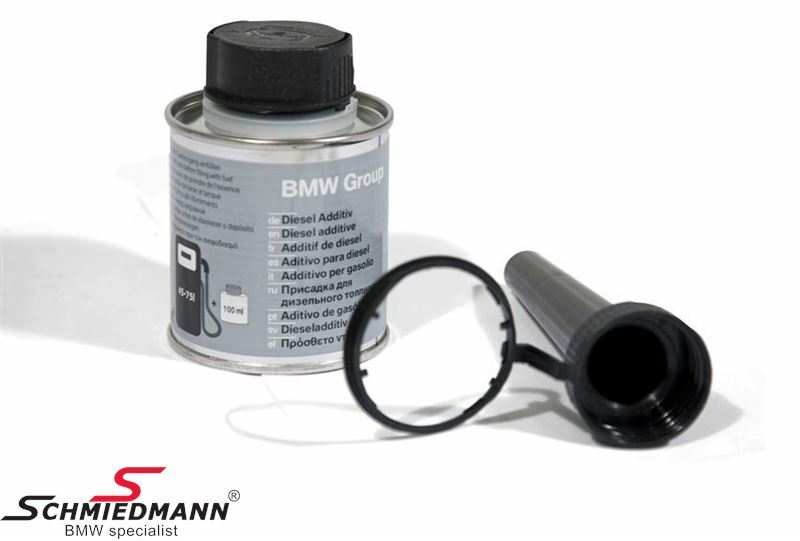 BMW diesel engines require fuels in compliance with EN 590 with a minimum cetane number of 51. The use of heating fuels, marine fuels or biodiesel fuels is prohibited. *The use of larger parts of fuels such as "biodiesel" or "rapeseed methyl ester" will result in leaks that can cause considerable subsequent damage. Exception: M47, M51, M57 with SA201 ”RME Version”. Stanadyne Performance Formula. Only additive marketed by a diesel fuel injection component manufacturer. '08 E60 535XI 6 speed manual!!! So this would lead me to believe that most readily available fuels in my are probably 10-11 points lower than BMW requires..
Not clear on what he exception refers to however? Isn't the engine in my 2013 the 'M57Y'? So would that fall under the exception, or no, and what is the exception I am left wondering.. This gets more confusing by the day.. LOL! The exception refers to the use of biodiesel and is only relevant to an M57 enigine vehicle if the vehicle has the SA201 option. All other M57 variants (inc. mine and probably yours) need cetane 51 and no biodiesel. Here in NZ the minimum cetane rating is 50, although it is possible to get lower rated diesel fuel (marine diesel for instance). Originally Posted by Chris F.